1. In sequence through the squares R --> B --> G Square 1, then G (square 1) --> R (square 2) etc. 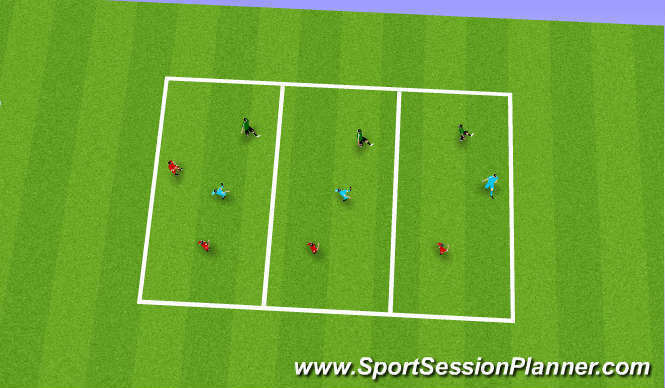 10 repetitions target one or two touches. 2. Leading to passing through the suares 1 -- 4 in all squares. e.g. R & B v G. one complete cycles = 1 goal e.g. squares 1--4 then B & G v R etc. 3. game to test above techniques, tacticks and vision. 1. up back & through both ways, ceciver in middle. 1, lay back. 3. Intrerplay other two players on grid. Technical: ablility to use different passes & surfaces of the foot. Bent, straight, undercut, inside, outside, toe poke. Tactical: to recognise the angle and distance needed from the supporting players and good vision. Physical: to establish through the practices and routines the ability to ajust the body = balance, agility & co orination in the right way to the ball. Psych/ Social: Communication = verbal, non verbal & body language. interpersonal - self talk, dialogue. Coaches Comments: we are trying to develop a systematic developing of thinking and awareness, the players found the 2nd practice difficult to begin with after 25 mins they did well. game intelligence and recognising situations needs constant attention and deep repetitive practice.